Aloha, my name is ShayLinn, but I go by Shay. I was born in Phoenix, Arizona. When I was two weeks old my family moved to Denver, Colorado. I grew up with four siblings; five of us total. There were four girls and one boy. My brother, the youngest, stopped breathing when he was a baby. After being revived the outcome was cerebral palsy. My loving mother decided after many years as a mechanical designer to change careers and become a massage therapist. This was to help my brother to be more comfortable in his body, as well as helping other people be more comfortable in theirs. She has been licensed in Colorado since 2000. Seeing firsthand what massage therapy can do helped make me interested in becoming a massage therapist myself. The effects and outcomes of massage therapy can be amazing!! I moved back to Arizona when I was 16 years old, and graduated from Dobson High School. I moved back to Colorado for three years and recently moved back to Arizona. I love Arizona weather. I figure as long as I can put up with three months of HOT, I enjoy the other nine months of grilling weather! I love to grill, and that is hard to do with snow blowing down your neck. That’s what happened my first week back in Colorado when I was grilling for our family dinner. It was COLD. While I was in Colorado I attended the Massage Therapy Institute of Colorado – MTIC. I graduated in 2015 with a 900 hour certification. The school taught me many modalities such as Swedish, Deep Tissue, Lymphatic Drainage, Neuromuscular Therapy (NMT), Thai Massage, Acupressure and Meridian Therapy, Craniosacral Therapy, Motion Palpation, Kinesiology (posture and movement), sports massage and how to integrate these all into a customized treatment for each client. It was a broad based and very well rounded program. I believe there is a massage therapy plan for every BODY. 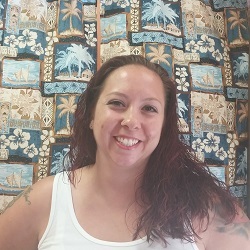 I look forward to working at Hawaiian Experience Spa so I can meet you and work with you to find the massage therapy plan for you.